The most intriguing, must-see special exhibitions from around the world shown in an environment specially designed to showcase them. Discover something for every member of the family that will intrigue, delight and awaken an interest in the joys of art. What was artist trying to say? Art excites the imagination. It provokes conversation. Start one of your own with a visit here. Spend a day – or two or three – wandering through galleries filled with works from our permanent collection and traveling exhibitions. From the art of antiquity to modern masters like James Turrell, this is a place to sit in wonder at the beauty of what endures. Here, in an extraordinary place is an extraordinary collection of art. From the Rubens Galleries to the Turrell Skyspace, view the permanent collection’s treasures, the fascinating exhibitions from around the world and the classical sculptures that fill the grand courtyard. The State Art Museum of Florida, this awe-inspiring palace was originally built by famed circus impresario John Ringling as a legacy to the citizens of Florida. This is a place of beauty and wonder. In 1925, circus impresario John Ringling (1866–1936) decided to build an art museum, both as a legacy meant to outlast his business interests and as a memorial to his wife Mable and himself. By sharing the arts of Europe with the people of Florida, Ringling sought to educate and encourage curiosity for the wider world. John H. Phillips designed the Museum—a pink, Renaissance-style palace with 21 galleries enclosing a courtyard graced with copies of iconic sculptures. 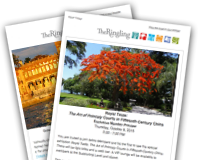 First opened in 1930, Ringling filled the Museum with European paintings, paneled rooms from the Gilded Age Astor mansion in New York, and ancient and medieval objects purchased from distinguished collections. Upon his death in 1936, Ringling bequeathed the Museum to the people of Florida. Opened in 2007, the Ulla R. and Arthur F. Searing Wing hosts rotating exhibitions and houses Joseph’s Coat, a Skyspace created by internationally-renowned artist James Turrell, a dazzling experience of light, sky, and color. The Museum of Art also includes the Center for Asian Art. The 25,000-square-foot Center includes galleries dedicated to rotating installations of The Ringling’s Asian art holdings, a 125-seat lecture hall, an object and print study room, and open storage spaces to increase public access to the collections. As a complement to the Center for Asian art, a Japanese tea house (chashitsu) was designed and built in the Bayfront Gardens. The Ringling Tea House was designed to marry the traditional tea house with our local architectural heritage. The Keith D. and Linda L. Monda Gallery for Contemporary Art is devoted to artists working in the 20th and 21st centuries. Many of the contemporary pieces that will be diplayed in the Monda Gallery have been acquired over the past five years from major exhibitions associated with The Ringling’s Art of Our Time initiative as well as through generous contributions from donors. The Ringling is in the process of reinstalling the Museum of Art’s original 21 galleries. Hundreds of works of art from The Ringling’s permanent collection will be examined, interpreted, and arranged in new ways. Through new thematic arrangements and updated wall treatments, lighting, and labels, the reinstallation project will transform the visitor experience of our permanent collection. We appreciate your understanding and look forward to sharing the results of this important work with you. As the reinstallation project progresses, certain galleries may close temporarily and objects may be removed from the galleries where they are normally displayed.